Take a walk through a professional kitchen, and you'll notice that most of the stuff in there is larger than anything you have at home. Each oven can hold 10 chickens at once, the stockpots are spacious enough to bathe in, and the refrigerators are entire rooms. Whatever pride you may have about your newly acquired KitchenAid stand mixer will shrivel as soon as you spot the Hobart, a super-sized version that sits on the floor and has a gate around the mixing bowl to prevent people from falling in. If you think a little fat can impede a dough's gluten development, just imagine what an entire human arm would do. Baking sheets in pro kitchens are bigger, too, with full-size ones measuring 18 by 26 inches, twice the size of the 18- by 13-inch trays we use at home. That's right: Your baking sheet is merely a half-sheet pan. Half sheets are about the only size you'll find in most home kitchens (unless, of course, you're in my mother-in-law's kitchen, in which case you'll find an assortment of irregular, off-brand ones, banged-up and flimsy, that you inexplicably continue to use even after I've bought you a set of brand-new heavy-duty half sheets for Christmas). Anyway, that leads me to the next funny thing about professional kitchens—while most of the stuff you encounter there will be oversize, you'll also find a ready supply of surprisingly tiny baking sheets. First, there are the quarter-sheet pans, which are, as you may have guessed, half the size of half sheets. Then there are the truly Lilliputian eighth sheets, half the size yet again. Those smallest ones measure a mere six and a half by nine and a half inches. 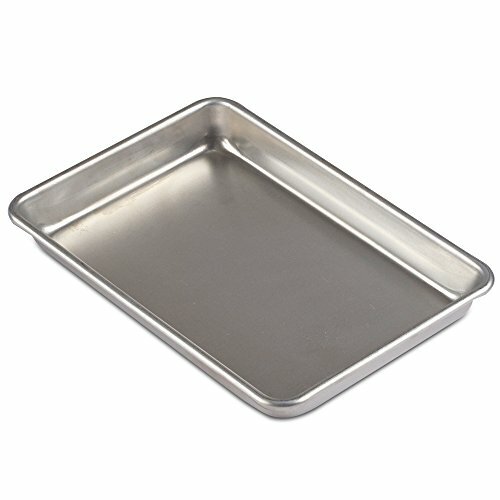 For whatever reason, these smaller sheet pans rarely make their way into home kitchens. It's bizarre, because, as handy as they are in commercial kitchens, they're even more useful at home, where we routinely cook smaller portions of food. Using a data set limited strictly to myself, I've come up with my Theorem of Domestic Sheet Pan Utility, which states that home usage of a sheet pan is inversely proportional to its size—the smaller a sheet pan gets, the more you'll use it. This is hard science here, so don't try arguing with me. Let's look at real-world examples. Just as one should try to select an appropriately sized pot or pan when cooking, one should also try to pick the right size sheet pan for any given task. Cook a single burger patty in a 12-inch skillet, and all you'll gain is a bigger area of burnt-on crud to deal with later. So it is with sheet pans. If I'm roasting a large serving of broccoli or cauliflower, or cooking a spatchcocked chicken, a half sheet makes the most sense. But as my ingredient volume goes down, so does my sheet pan size. Roasting a four-bone rack of pork? A quarter sheet can work well for that. Toasting some grains or nuts, or reheating a leftover chicken leg from yesterday's dinner? An eighth-sheet pan will do you right. A sheet pan that's too large for the task simply provides extra space for juices to dry out and burn, and takes up more countertop and oven space than is required. These smaller sheet pan sizes also tend to be more useful for organizing your mise en place, since they can hold a variety of ingredients in discrete groups without overtaking limited counter space. Plus, you can steal a page from the surgeon's handbook, using smaller sheet trays to hold tools like paring knives, vegetable peelers, bench scrapers, and even tweezers, if that's your thing. What could be more fun than extending your hand, saying, "Scraper, please," and having a kitchen helper take it from the tray and place it on your expectant palm? If your answer is "many things," I guess your life is more exciting than mine. Having a ready stack of eighth sheets and sizzle platters in my kitchen is a godsend for quick and easy meal prep. I can't tell you the number of nights when I'll grab one or the other, cover it with a small sheet of aluminum foil for easier cleanup later, and set a couple pieces of fish on it. Then I'll toss it under the broiler until the fish is browned on top and just cooked through. It's quicker, it's cleaner, and it's way less cumbersome. Bigger, clearly, isn't always better.